R.D.Gardi Medical College is extensively involved in various fundamental and applied medical researches pertaining to clinical, para-clinical and socio-medical areas with a high international academic profile. In due-course of just 10 years RDGMC has earned a distinguished reputation both in India and internationally for its excellent and result driven collaboration in research and medical services in the rural areas of Ujjain district. Public health research is the main focus of research activities at RDGMC, which is achieved through its active involvement both in fundamental and applied research. The Department of Scientific and Industrial Research, Ministry of Science and Technology, Government of India recognize R.D. 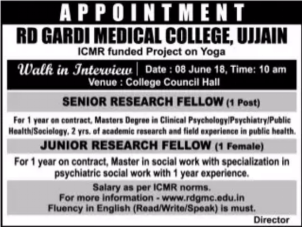 Gardi Medical College as a Scientific and Industrial Research Organization (SIRO). Undertake desk research and review on topic related to physical activity, wellbeing. Pilot studies and pilot testing of instrument. Organize and carry out main studies, pre and post intervention followups. Able to develop and supervise health related quality of life, well being, mobility and fall index, pain, sleep quality index and other related tools. Mandatory Qualification: Masters or equivalent degree in clinical Psychology/Psychiatry/Public health /Sociology having 2 years of academic and field experience in public health. Demonstrated ability to work as part of a team to achieve common goals. Experience in using STATA or SPSS. Support in desk research and review on topic related to physical activity, wellbeing. Support RA in Pilot studies and pilot testing of instrument. Mandatory Qualification: Master in social work with specialization in psychiatric social work with at least 1 year experience. Fluency in English(read\write\speak) is must.